The follow-up to 2012’s God Curse Us bursts straight through the gate upon pressing play – crossing all the fun-loving qualities of gallop metal with the dark and miserable tones of doom metal. While the trio’s previous album was often guilty of pooling too hard from a fountain of Electric Wizard worship, No Light Only Fire sees Witchsorrow carve out their own niche and it’s one that’s as aggressive as it is catchy. The trio not only want to incite hatred for their fellow man, they want their listeners to experience it also. There are slower paced melodies in the mix too; The Martyr showcases all the qualities of traditional British doom metal with an added flair of subtlety and simplicity. Juxtaposed with the likes of Made Of The Void, which features almost gleeful sounding riffs, this record is a veritable smorgasbord of all of the emotions that doom can invoke within its listeners, taking them on a journey of fist pumping highs and hopelessly devastating lows. The soundscapes conjured within each song drag you down kicking and screaming to a murky depth where the way has been both lit and ravaged by hellfire. There’s lots of showmanship within the guitars, with complex and elaborate solos shoehorned into every song. Instead of making the music feel too busy or complicated it actually makes for a more interesting listen, and one that’s bolstered by the methodical drumming and understated bass guitar. Witchsorrow have truly grown as musicians and songwriters and this record showcases the best of each member’s abilities – creating heavy and well-crafted tunes that are played with an enthusiasm that comes across as organic and naturally progressive rather than forced showing off for the sake of it. This is an excellent first release for their new label home, Candlelight, as well as an ominous ode to the destruction of mankind. No Light, Only Fire will certainly tick all the boxes for every diehard fan of doom out there; classic sounding riffs that are delivered in a manner that’s both groovy and monolithic. 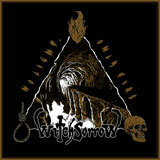 Witchsorrow have created a modern take on the traditional, but one that works and will certainly get heads nodding.